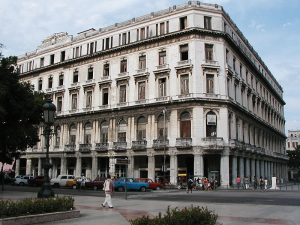 CUBA STANDARD — State company Habagüanex is partnering with Gaviota S.A. to turn an early-20th century landmark building in Old Havana into a 246-room luxury hotel. The new hotel, going up in a gutted Manzana de Gómez, is located on the western margin of Old Havana, just east of the Paseo de Martí, across the Parque Central from the luxury hotel of the same name, and near the landmark Floridita Bar. In what would be the chain’s first footprint in the western hemisphere, Swiss luxury brand Kempinski signed a letter of intent to operate the five-star hotel. The Geneva-based company with roots in Germany focuses mainly on central and eastern Europe, the Middle East, China and Africa. The Manzana de Gómez hotel is scheduled to open in 2016. The building occupies a whole square between Avenida Bélgica, and San José, Neptuno and Agramonte streets. The project includes an indoor gallery with stores, two restaurants, a pool, rooftop terrace, gym, and glass elevators. 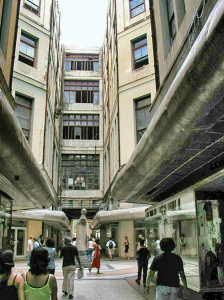 Built in 1910, the five-story Manzana de Gómez was the first indoor shopping mall in Havana. The building, with two inner diagonal streets that cross the building in all directions, has hosted upscale retailers, offices, embassies, consulates and schools. Habagüanex, the state company in charge of tourism in Old Havana, is working jointly with Gaviota on two other prominent projects — the Packard Hotel and a yet-to-be-named hotel on Prado and the Malecón seaside boulevard. Gaviota, owned by the armed forces, has expertise in construction and engineering services. Three blocks from the Manzana de Gómez, Habagüanex is restoring the Capitolio building, the once and future home of Cuba’s National Assembly.